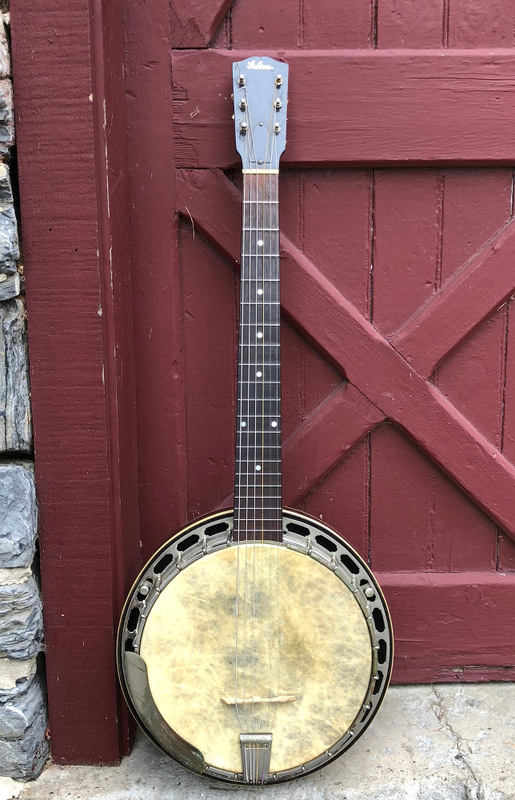 Gibson GB1 Guitar Banjo 1936 | SOLD | The Gibson GB-1 (guitar banjo) was created to allow the guitar player to get the then-popular 'banjo sound'. The GB was made to Gibson's high standards, and today they are quite rare in the vintage market. This particular example was owned by renowned finger-stylist and teacher Stefan Grossman, and he used it on tour for many years. This example dates to 1936, FON 816-3. It has a one-piece flange and an attached arm rest. 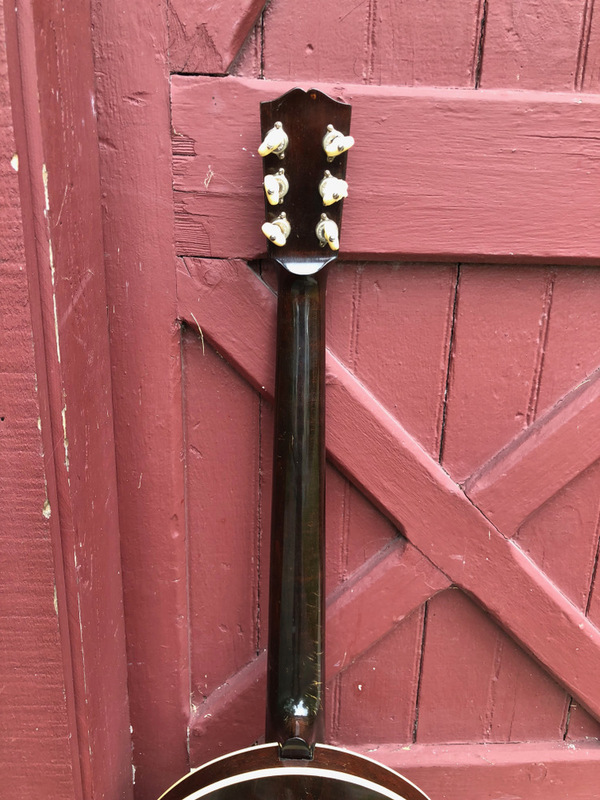 The neck is mahogany, with a script 'Gibosn' logo inlaid in white on the head stock. The fingerboard is Brazilian rosewood. 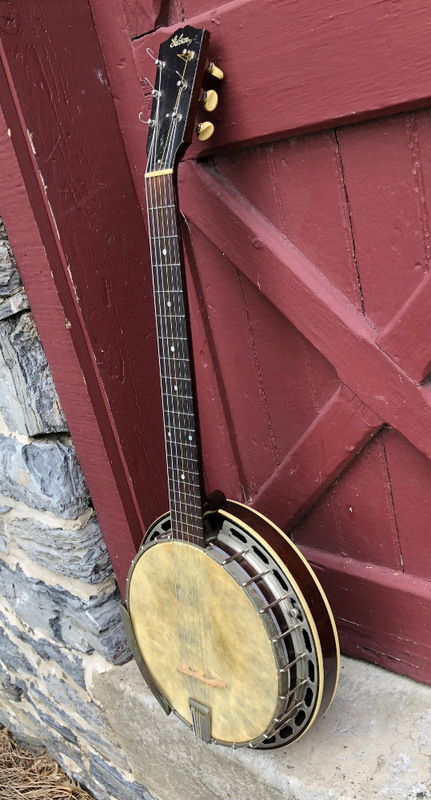 The tailpiece may be original, but missing its cover. The GB is in very good condition. The head is a replacement, as is the bridge. The Grover 'Pat.' tuners are original with one of the bushings replaced. No cracks or repairs evident, finish is original with only minor nicks and dings. The hooks are modern replacements, but the originals remain in the case. Scale length is 25 1/8". The finger board is 1 3/4" across at the nut. The head measures 11" across. The action is nice and low and the GB plays easily producing a strong, ringing tone with a fast decay, perfect for ragtime picking. Comes with an older Gretsch hard case. Check out the sound clip.